Deer tick: Photograph of a black-legged tick, also known as a deer tick (Ixodes scapularis). Image by the National Institute for Occupational Safety and Health / Center for Disease Control. Geologists and others who work in the field should have some knowledge about ticks and tickborne diseases. If left untreated, Lyme disease, Rocky Mountain Spotted Fever, and other illnesses caused by tick bites can lead to chronic neurological problems, severe joint pain that can persist for years, and, in some instances, death. Outdoor workers should know how to recognize ticks, avoid tick bites, and recognize the early signs of Lyme disease and other illnesses caused by tick bites. Early treatment can often produce a rapid and complete recovery. 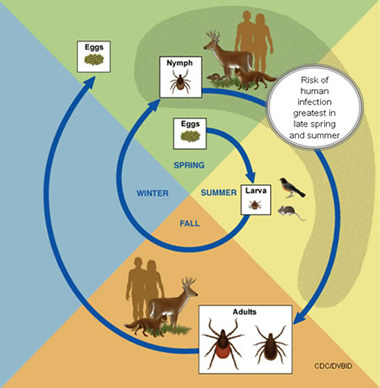 Graphic showing common types of ticks and their appearance at different stages of their life cycle. Image by the National Institute for Occupational Safety and Health / Center for Disease Control. This short video from the Centers for Disease Control presents the story of John, who contracted Lyme disease from a tick bite, while on a camping trip with his son. John describes his early symptoms and diagnosis. His physician, Dr. Heaton, explains the common concerns that most patients have about Lyme disease. The video concludes with John suggesting some tips for avoiding tick bites and Lyme disease. Graphical representation of the two-year life cycle of the blacklegged tick. People are at greatest risk of infection while the tick is in its nymphal stage during the spring and summer of its second year, with additional risk from adult ticks in the fall of its second year. Center for Disease Control. In the spring the ticks are very active and searching for another blood meal. When the tick feeds again it transmits bacteria into its host. The host is usually a rodent; however, this is the stage when humans are usually bitten. These bites usually occur in the late spring and summer. This is the time of year when humans should take the greatest precaution. The nymphs progress to adult stage in the fall. Adult ticks usually feed on large animals and sometimes on humans. In the spring, the adults lay their eggs on the ground and their life cycle is complete. Map showing the geographic range of the blacklegged tick and the western blacklegged tick. Map by Geology.com using data from the Center for Disease Control. Map showing the incidence of Lyme disease in the United States. Values are the number of confirmed cases per 100,000 population. Map by Geology.com using data from the Center for Disease Control - 2010 data. 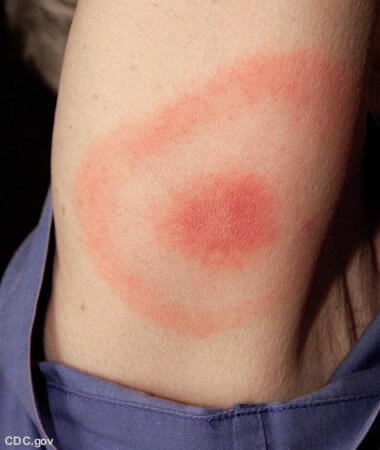 Photograph of the circular rash known as "erythema migrans" that is often present in the early stage of Lyme disease. Note the "bull's-eye" pattern that surrounds the site of the tick bite. Lyme disease patients who are diagnosed early, and receive proper antibiotic treatment, usually recover rapidly and completely. Photograph by James Gathany, Center for Disease Control. Ticks live in wooded and brushy areas with abundant leaf litter. They also live in high grass. Avoid these areas. Take extra precautions in May, June and July. This is when the ticks that transmit Lyme disease are most active. If you walk through a tick area, walk in the center of the trail and avoid contact with grass, trees, brush and leaf litter. Ask your local health department and extension service about tick-infested areas to avoid. Use insect repellent with 20% - 30% DEET on exposed skin and clothing to prevent tick bites. Effective repellents are found in drug, grocery and discount stores. Wear long pants, long sleeves, and long socks to keep ticks off your skin. Light-colored clothing will help you spot ticks more easily. Tucking pant legs into socks or boots and tucking shirts into pants will help keep ticks on the outside of clothing. If you'll be outside for an extended period of time, tape the area where your pants and socks meet to prevent ticks from crawling under your clothes. If a tick is attached to your skin for less than 24 hours, your chance of getting Lyme disease is extremely small. But just to be safe, monitor your health closely after a tick bite and be alert for any signs and symptoms of tickborne illness. Remove a tick from your skin as soon as you notice it. Use fine-tipped tweezers to firmly grasp the tick very close to your skin. With a steady motion, pull the tick's body away from your skin. Then clean your skin with soap and warm water. (For more details see information at left.) Illustration by the Center for Disease Control. Save Any Tick that Bites You! Ticks are responsible for the transmission of a number of diseases. If you are bitten by a tick, store the tick in your freezer or in a vial of alcohol. Diagnosing and treating an illness is often much easier if the tick can be identified and studied by medical professionals. Avoid crushing the tick's body. Do not be alarmed if the tick's mouthparts remain in the skin. Once the mouthparts are removed from the rest of the tick, it can no longer transmit the Lyme disease bacteria. If you accidentally crush the tick, clean your skin with soap and warm water or rubbing alcohol. Don't use petroleum jelly, a hot match, gasoline, nail polish, or other products to remove a tick. After the tick is removed, wash your hands and the bite location thoroughly with soap and water or rubbing alcohol. Clean the tweezers with rubbing alcohol. Lyme Disease: Some of the most comprehensive and trusted information on the web for Lyme disease can be found at the Center for Disease Control and Prevention website. Preventing Tick Bites: How to avoid tick bites on people and on pets from the Center for Disease Control and Prevention, website article, 2011. Tick Removal: Don't panic. This article on the CDC website explains exactly what to do to remove a tick. Center for Disease Control and Prevention, website article, 2011. Rocky Mountain Spotted Fever: Statistics and Epidemiology by the Center for Disease Control, 2012. Tickborne Diseases of the United States: Descriptions of tickborne diseases known to occur in the United States including: anaplasmosis, babesiosis, ehrlichiosis, powassan, rickettsiosis, southern tick-associated rash illness, tickborne relapsing fever, and tularemia. By the Center for Disease Control, 2013. Other Tickborne Diseases in the U.S.
Lyme disease symptoms vary from one person to the next. If you suspect that you have symptoms, it is VERY important to see a physician immediately. In most people, the first sign of an infection is a circular rash that often appears as a bull's-eye pattern around the site of the bite. This rash usually appears within 3 to 30 days after the bite occurs. (See photo.) The rash usually expands over a few days and is sometimes warm to the touch. An infected person may also experience symptoms such as fatigue, headache, fever, muscle aches, joint pain or swollen lymph nodes. Treatment should be sought right away if you have the above symptoms. The disease is usually easy to cure if treated during the first few weeks. If it is allowed to progress, severe neurological and joint problems can result and these can persist for years. 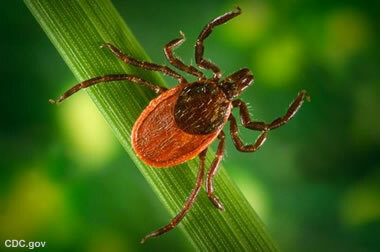 State health departments reported 28,921 confirmed cases and 6,277 probable cases of Lyme disease to the CDC in 2008. This represents a 5% increase in confirmed cases compared to 2007. The definition and reporting of probable cases was initiated in 2008 based on revisions to the national surveillance case definition. Chart by the Center for Disease Control. Most cases of Lyme disease are concentrated in a few areas; however, cases have been reported in all 50 US states. Most infections occur in the northeast, in the Great Lakes region, and along the Pacific coast (See incidence map.) Lyme disease can occur anywhere that infected animals live together with ticks that can transmit the bacteria. This graph shows the increasing number of human cases of Rocky Mountain Spotted Fever that have been reported to the Center for Disease Control on an annual basis between 1993 and 2010. Graph by the Center for Disease Control. Another deadly disease that is transmitted by tick bites is Rocky Mountain Spotted Fever. Most people who develop this disease do not remember being bitten by a tick. Between 2 and 14 days after the bite they begin to experience some combination of fever, rash, headache, nausea, vomiting, muscle pain, lack of appetite, and eye inflammation. Obtaining immediate medical attention is essential to prevent serious illness or even death. Rocky Mountain Spotted Fever is on the rise in the United States, and its geographic distribution is widespread. A map showing incidence by state and a graph showing the rapid rise in reported human cases are shown on this page. Rocky Mountain Spotted Fever is another disease that is transmitted by ticks. The American Dog Tick and the Arizona Dog Tick are among the responsible species. Rocky Mountain Spotted Fever can be fatal. Map by the Center for Disease Control. Knowledge is the best way to stay safe. 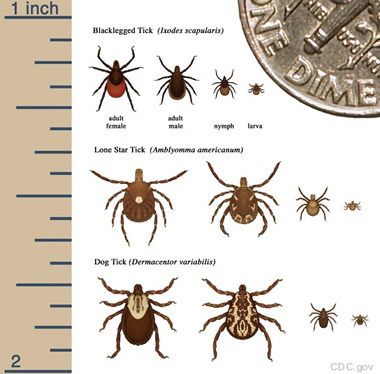 If you work or play outdoors, especially in the northeastern or north-central United States, it is very important to learn about ticks and tickborne disease. That is the most effective way to improve your chance of avoiding infection.